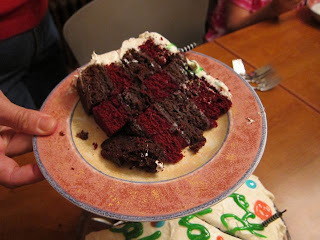 The task for this year's birthday cake was a checkerboard. 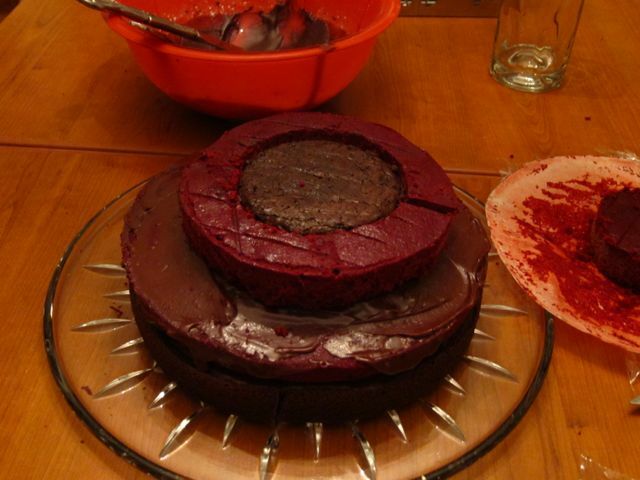 I hit upon using red velvet and chocolate as the 2 colors and made 2 layers of each cake. Once the layers were cooled and had spent some time in the fridge, I cut them using pyrex bowls as guides. Then I froze them to make them easier to work with. Assembly involved popping the center circles out and making one or two cuts in the outer circles and fitting them around each other. I used a fudge frosting to hold everything together and toothpicks to keep the rings from gapping too much while the frosting set. This all went into the fridge overnight and then was frosted the next day. I used 2 tubs of cream cheese frosting. The first tub was used entirely as a crumb coat and to fill in the gaps between the layers (the red velvet cake didn't rise as high as the chocolate one) and the other tub made it look pretty. It was only after I came up with my plan and executed it that I discovered that there is such a thing as a checkerboard cake mold which eliminates the need for all the cutting and assembly. Oh, well, this was fun and challenging and it came out wonderfully anyway! This is the time of year when, as the weather cools, the nettles start growing again. Yesterday I picked a bunch of the tops of the plants; after blanching them it was about a cup. But, other than soup and risotto, what else could I do with them? 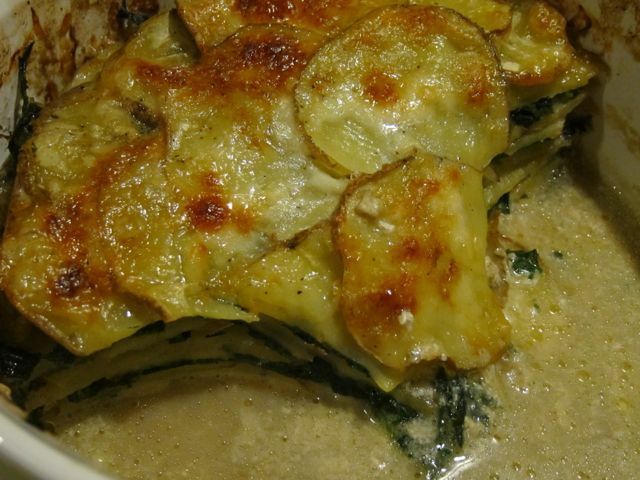 Potato-nettle gratin! I used 2 pounds of potatoes from my farm share and layered them with the nettles, salt and pepper, gruyere cheese and some half-and-half. The recipe for potato gratin, from Vegetables Every Day by Jack Bishop, calls for heavy cream, but I didn't have any. Half-and-half never really does the right thing when it's heated, though, but I'm much more likely to have it on hand than cream. Anyway, this was baked for about an hour at 375 degrees and it was terrific. The nettles really worked with the nuttiness of the gruyere. Served with a steak and an arugula and goat cheese salad, it was a perfect autumn side dish. I will definitely make this again! But I think we already established that, right? 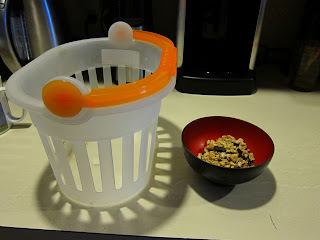 I only ended up with half a cup of walnuts that were edible. These were roasted in the oven at 200 degrees for half an hour. Then, what to do with them? All roasted and ready to eat! Yesterday in the farm share we got another half-peck of apples, mostly Macintoshes again. I made a chunky sauce this time: peeled and cubed, with 1 cup of sugar and a cup of water and cooked until it was the right consistency. I took out one quart and then added the walnuts to what was left. One quart of that is also in the canner and the rest, about 1.5 cups, will be served tonight with a pork roast. 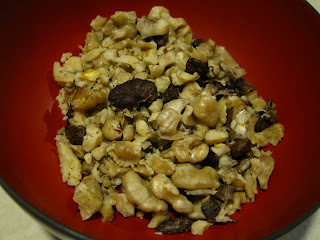 I do like the flavor, more robust and fresh tasting compared to regular walnuts. I think it'll go well with the roast, don't you? This morning I asked my husband, "Should I make peach salsa or a pie?" He looked at me with an expression that said, "Why is this even a question?" Look at that nice and flaky crust! 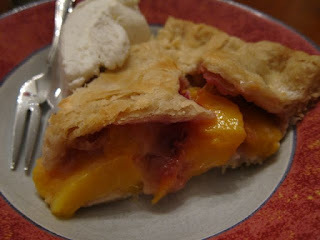 This was the first time I made a peach pie in my life. In the theme of "everything is better when it's baked in a pie," I just have to say that this was fabulous. It might even tie apple as my all time favorite pie flavor. I used my standard pie crust recipe but decreased the salt to 1 teaspoon from 1.5 because the apple pie I made a week or so ago was a little salty. I sliced 5 cups of peaches and mixed in half a cup of confectioner's sugar, 1/3 cup of flour and half a teaspoon of cinnamon. 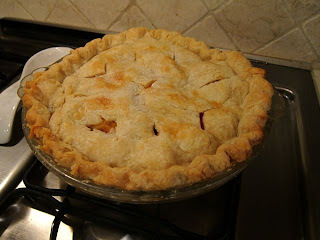 I used the same baking times and temperatures as the apple pies: cover the pie and bake 15 minutes at 425, then 15 minutes at 375, then remove the foil and bake another 30-40 minutes at 375. And, once again, I'm so happy I waited for the freestone peaches! This morning, after the kids got on the bus and before I go to work, I put up 3 quarts of peaches. This year I'm trying the hot pack method as it always looks so sad when I have a quart jar that is only half full of peaches. They shrink less with the hot pack method. At least, that's the hope. They're still in the canner, so I won't know until later. Well the farm came through and there was a half-bushel of freestone Elberta peaches waiting for me this morning. I'm very happy! The first project with them was a batch of peach jam. My grandmother used to put one maraschino cherry and one whole almond (without the brown skin) into each jar so I do the same. But isn't it cool that I can use my homemade maraschino cherries! I now have 8 jars of jam and more in the fridge and the rest of the bushel will go to peaches in syrup. Maybe some peach salsa if I get tired of peach wedges. I'd pulled out 4 peaches but only used 3 for the jam (they're huge) so we ate one. It was so ripe it was practically disintegrating in our mouths. Yum! All summer I've been waiting to put up peaches. Last summer I went to the farm closer to me but wasn't happy with the squishiness factor of the B-grade peaches I bought. I decided to go back to the other farm, which was further away, and also decided to wait for the freestone peaches. Well, they're in. 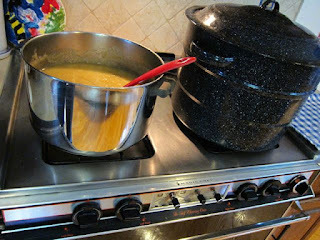 That's 4+ quarts of applesauce in my largest pot! Yesterday morning I called to see if they would have any half-bushel boxes of the freestone peaches. The farm staff left a message on my phone saying yes, they would, and they expected to have a lot. So today I was in the area and stopped by at 11:30 am. Only to find they were sold out! I put my name in for them to reserve a box for me tomorrow and I'll go back there and get it. It was a bit of a mob scene there as apple picking had begun and there were literally about a hundred cars. Tomorrow promises to be no different. To satisfy my need to can something, anything, today, while I had some time, I made another double batch of applesauce using most of the rest of the ones we picked last weekend and another half-peck of Macintoshes from the farm share. I made 4 quarts of smooth sauce with white sugar. This makes a total of 9 quarts so far. I think I'll devote the rest of the apples I get this fall to making some chunky applesauce for those of us who like it. And tomorrow, I'll go get some peaches. Again with the collecting things! Back in June we had gone on a foraging walk one evening and were introduced to autumn olives. Once I knew what to look for, I was finding them more and more, and just waiting for those little berries to ripen. In general they should be ripe in October around here, but because of the previously mentioned wonky weather patterns, they are ready now. The plant at the stables has been rather meager, so I thought I'd just head on over to where those other plants were at the site of our foraging walk. They were plentiful and sweet and I was prepared! I collected about 4 cups in a ziploc bag and headed off to my next errand of the day. It took about an hour to get that many. I didn't have any more time and I was, at that point, quite done with stripping berries off their branches. By the time I got home this evening I was rather distressed to learn that I needed 8 cups to make a decent batch of jam. So I improvised a bit. 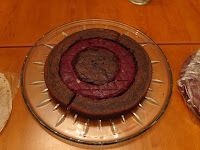 The standard Certo recipe for sour cherries is 4 cups of fruit to 2 packages of pectin. After I simmered the autumn olives in water and ran them through the food mill, I had just over 2 cups. That'll do! I mixed those 2 cups of puree with 3 slightly heaping cups of sugar and 1 package of the pectin. This, following standard techniques, made 4 8-ounce jars of jam and a little bit for tasting. It tastes really wonderful; tart and like cranberry with a little less bite. This morning I made dilled carrots with all the carrots I'd stashed from the farm share - just under 5 pounds. This hasn't been a banner year for carrots, it seems. We've gotten tons of onions, peppers, eggplant and squash, but really not a lot of tomatoes, carrots, or beets. Every year is different. Also, there has been no dill from the farm, so I had to buy some. Which meant this batch has dill sprigs and not the flower heads. It still works just the same. I used my Korean red pepper this time, and made 4 pints with the red pepper and 1.5 pints without. (That last half-pint is all the odd sized ends of the carrots, cut into pennies.) I think 5.5 pints of dilled carrots will be enough for a year, anyway. It's raining out today so any plans I might have had to do yard work or walk in the woods looking for berries is pretty much out of the question. We're going to the stables later; maybe if it isn't raining I'll look there. Last week I came home with a bunch of Concord grapes and a handful of autumn olives - not enough of either to do anything at all. We just got back from our annual camping trip. In opting for Labor Day weekend, we ended up camping much later than usual (but got a bonus day out of it!) and, with the weather being what it's been, the foraging was all wonky. Gone were the blackberries which would have likely been abundant 3-4 weeks ago. Long gone were the blueberries. However, there was apple picking and a surprise find of elderberries. I think they are elderberries. 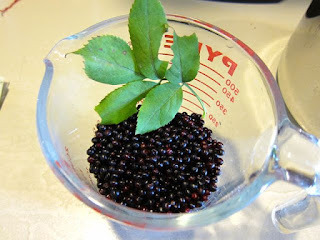 I looked it up on my phone, confirmed from several different sources that I had elderberries and not water hemlock berries or devil's walking stick berries. Neither of which is good to eat, but my husband felt that "Devil's Walking Stick Jam" was a great name for a jam. Sigh. I even crushed a berry to determine how many seeds were in it. Everything checked out, so I picked every ripe elderberry I could find. Don't worry, I left many unripe ones for the animals to eat or for the seeds to propagate or whatever normally happens to elderberries. Even with all that, I came home with exactly one cup of berries. The recipes all call for 8 cups, or 3 pounds, or some other crazy amount which was simply unattainable given the shrubs I found. I pared down the old fashioned (pectin-free) recipe for 1 cup and made exactly one 8-ounce jar of jam. Which I tasted, being the official taste tester of all things foraged. It's a complex flavor, and I'm bound to like it because I'm just plain excited that I found something I wasn't expecting simply because I was open to the experience. I've also made 2 batches of applesauce, which made 5 quarts, and I still have a lot of apples to work through. I used entirely macintoshes for these batches but the first batch was slightly *ahem* caramelized, which made it a nice color. The second batch got some cinnamon because it was a really strange green color. While I have the canner out I'll can the rest of the sauerkraut that finished fermenting last week. It's been in the fridge; we took some with us on the trip and it went so amazingly well with the Bauernwurst and the Nuremburgwurst we brought. On the agenda this week: dilled carrots from all the farm share carrots, an apple pie, maybe more applesauce, and to figure out something to do with all the tomatillos in the farm share.